ARTOS loudspeakers are designed to reproduce an extremely natural, dynamic and realistic musical experience, offering impressive soundstage, basscontrol and timecoherence to set landmarks in music reproduction. 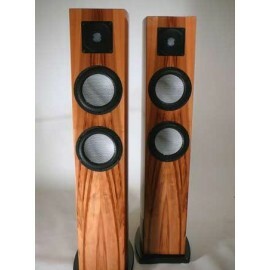 Our MOONGLOW is a premium-grade speakersystem owing many features even of our State of the Art model Hurricane. Its high efficiency, linear impedance behavior and minimal phase shifting equally suit for combination with single ended triodes as well as transistor amplification. Unconventional design solutions and perfect craftsmanship make them outstanding in many respects. 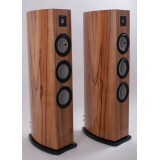 The MOONGLOW speaker is designed as a 2,5-way System. Innovative AIRFLOW and RESONANCE technologies and the best available components have been used by our designers to create a speakersystem that combines »OLD WORLD'S CRAFTSMANSHIP with CUTTING EDGE ENGINEERING«. At ARTOS Audio we stand for a pure, timeless design which integrates perfectly into high quality interior design concepts of the speaker itself and domestic environments as well. Special designed ceramic drivers systems are supplied by the renowned manufacturer Accuton. 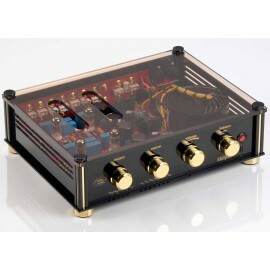 For a deep and precise bass reproduction three 9.0” Woofers and twoo 7.0” Woofer are used. A 7.0” ceramic midrange driver delivers a smooth and rich vocal timbre while a 1.2” Black Diamond Tweeter takes care of the high frequency range. Because these drivers are custom made by Accuton to match the behaviour of the Air-FLow-Cabinet, we have been able to develop a crossover that uses only a few high quality parts from Mundorf. The perfect phase linearity and impulse response are the result of this design.